Study: Subjective Rating of Perceived Back Pain, Stiffness and Sleep Quality Following Introduction of Medium-Firm Bedding System. The groundbreaking study “Subjective Rating of Perceived Back Pain, Stiffness and Sleep Quality Following Introduction of Medium-Firm Bedding System,” published in the Journal of Chiropractic Medicine (Winter 2006), confirms the link between a new mattress and improved sleep. The first – and only – research of its kind, the study provides firm scientific evidence of the critical link between mattress quality and sleep quality, as well as the importance of regular mattress replacement. The study, authored by Bert Jacobson, EdD, Tia Wallace, MS, and Hugh Gemmell, DC, EdD of Oklahoma State University, studied a control group of 59 healthy participants (30 women and 29 men) contrasting the participants’ sleep on their own mattresses (at least five years or older) to their sleep on a new bedding system. The researchers noted that sleep deficiency interferes with daytime activity, social interactions, mood and loss of work productivity, further making the case that sleeping on a new mattress can improve overall quality of life. When sleeping on a new mattress, respondents reported significant reductions in lower back discomfort and spine stiffness together with significant improvements in sleep quality and sleep comfort. The improvements were significant regardless of participants’ age and weight. What’s more, even those who originally reported they did not have back or sleep problems showed significant improvements on a new mattress. The study showed the age of participants’ original mattresses contributed significantly to back stiffness. (Note: participants’ beds were 5 years and older, with a mean age of 9.7 years). New bedding systems provided both immediate and sustained benefits in sleep. Participants noted an increased improvement in sleep quality each week, all attributed to the new mattresses. A good night’s sleep can lead to a happier, healthier, more productive life, and when the quality of sleep improves, the quality of your life improves. To Start Every Day with a Good Night’s Sleep™, the Better Sleep Council recommends evaluating mattresses for replacement every 5-7 years. 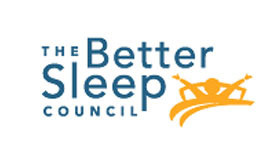 For more information on the link between sleep and the mattress, as well as tips on how to get a better night’s sleep, please visit www.bettersleep.org. Journal of Applied Ergonomics links greater sleep comfort to new mattresses. More findings from the groundbreaking 2006 research conducted at Oklahoma State University were published in the Journal of Applied Ergonomics in March. This is the second prestigious scientific journal that has published findings from the OSU study – the first was the More findings from the group d breaking 2006 research conducted at Oklahoma State University were published in the Journal of Applied Ergonomics in March. This is the second prestigious scientific journal that has published findings from the OSU study – the first was the Journal of Chiropractic Medicine (Winter 2006). The latest report links better sleep quality and comfort, as well as reduced back pain, stiffness and shoulder pain to sleeping on a new mattress, compared to mattresses 5 years old or older, underscoring the importance of regular mattress replacement. High percentages of the 59 healthy study participants reported significant improvements from pre- to post-test, including reduced back pain (62.8%), shoulder pain (62.4%) and back stiffness (58.4%), and improved sleep quality (64.4%) and sleep comfort (69.96%). In addition, the initial benefits improved over time, regardless of participant age, weight, height or body mass index. “Our work showed that new mattresses have a considerable impact on back pain and improved sleep quality, among other benefits,” said Bert Jacobson, EdD, lead researcher. “ Timely replacement and mattress quality can have a very positive impact on sleep and overall quality of life.” The study also reported that back pain was more prominent in participants who had been sleeping on the cheapest beds than those sleeping on moderately or higher-priced beds. Source: “Grouped comparisons of sleep quality for new and personal bedding systems,” March 2008 Journal of Applied Ergonomics, Volume 39, Issue 2, Pages 247-254; Article 15.l of Chiropractic Medicine (Winter 2006). High percentages of the 59 healthy study participants reported significant improvements from pre-to post-test, including reduced back pain (62.8%), shoulder pain (62.4%) and back stiffness (58.4%), and improved sleep quality (64.4%) and sleep comfort (69.96%). In addition, the initial benefits improved over time, regardless of participant age, weight, height or body mass index. The study also reported that back pain was more prominent in participants who had been sleeping on the cheapest beds than those sleeping on moderately or higher-priced beds. “Grouped comparisons of sleep quality for new and personal bedding systems,” March 2008 Journal of Applied Ergonomics, Volume 39, Issue 2, Pages 247-254; Article 15.